The Eastside has had a much wetter winter than previous years, during which time we too suffered from the widespread drought that affected much of California and the western US. The accumulation of snow at the higher elevations on both the Sierra Nevada and White Mountains has returned to more normal levels. Good soaking rain in the valleys has brought much needed water to our parched deserts. 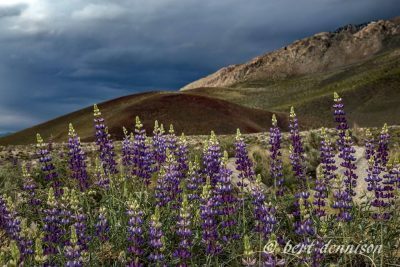 One wonderful result of these life giving rain showers is the potential for a big bloom in the Owens Valley and foothills of the mountains this spring and summer. The occurrence of a big bloom does, however, require a specific pattern of precipitation and temperatures and by all accounts it appears to have been just right. 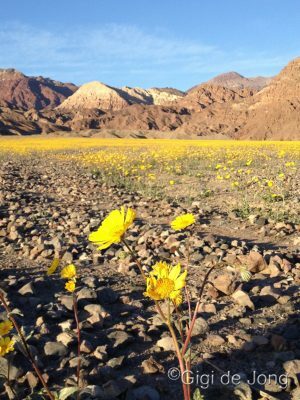 Many locals and visitors to the area have already witnessed what many termed the “superbloom” in Death Valley. 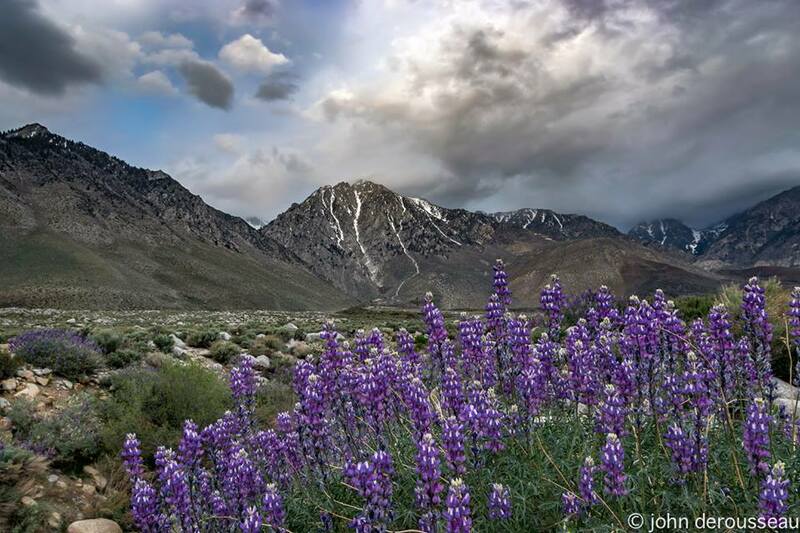 Now at the higher elevation of the Owens Valley the flowers are beginning to bloom in abundance. Soon more bloom will begin to erupt in the foothills of the adjacent mountains and thereafter it will creep up the canyons into the valleys and meadows toward the crest of the ranges. 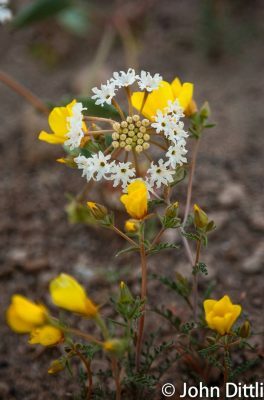 Wildflower bloom begins as early as March and continues throughout the summer – well into September at the high elevations. For those visitors from wetter climates it is important to note that many desert flowers are small and fine. The larger bushes of rabbitbrush and sagebrush sometimes obscure the floral carpet, but that’s not to say you won’t find fields of color. Viewing is best done on foot and why wouldn’t you want to? A walk on the wildside of the eastside can be a magical experience. Remember that the weather is quite unpredictable, especially in spring. Be prepared by dressing in layers and have a hat and sunscreen with you for the hot, sunny days. If you’re unused to the altitude you may find you get winded easily. Slow down … you’ll see more flowers that way too! 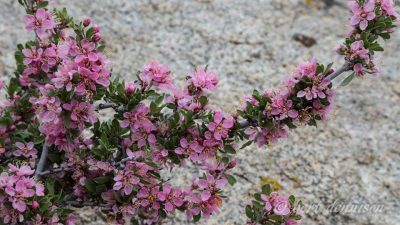 An excellent guide to finding the wildflowers of the Eastern Sierra is available to download in PDF form. Click here for a link to download. This hidden canyon is a lovely off-road adventure route that begins near Independence, 40 miles south of Bishop. At the south end of Independence turn east onto Mazourka Canyon Rd and head toward the Inyo Mountains. The route is 20 miles one way with the first 5 miles of the road paved. Thereafter it is a good graded dirt road that climbs to a little over 8,000 feet. Toward the top the canyon is narrow with steep sides and there may still be snow on the road at the higher elevations. Wildflowers here will be more prevalent at the lower elevations and the views out across the Owens Valley are quite stunning. A note of caution: Avoid this route if there are thunderstorms in the area. The canyon is prone to flash flooding. About 35 miles south of Bishop is Division Creek rd. A route of about 12 miles from the junction of Goodale rd and US Highway 395 west into the base of the Sierra Nevada brings you to a secluded high desert world. The road is paved along Goodale and Tinemaha roads, through Aberdeen, until you reach the Division Creek Powerhouse on Division Creek road. Here the bush lupines are bursting with blooms right now. Continue along the dirt road – you may need a high clearance 4×4 vehicle further along – and check out Scotty Spring and Spook Canyon. Interesting note: The Division Creek Powerhouse was the first power plant built by the agency that was to become the Los Angeles Department of Water and Power (LADWP). The original structure built in 1908 burned down and Unit 2 was built at the site and continues to be operational. There are three excellent routes for wildflower discovery in the White Mountains. The blooms are still more prevalent at the lower elevations currently, but as the season progresses flowers will be blossoming higher up. This road begins its westward route from just north of Big Pine. It is a gateway to so much adventure and discovery in the White Mountains that you’ll probably want to travel it often. Flowers may be evident from the road as it crosses the Owens River and heads up into the White Mountains and over the range into Nevada. This is probably be a good journey for later in the flower season. Branching off from US Highway 168 on the west side of the Owens River is a sinuous path to the higher elevations of the Inyo Mountains. Near the summit the road junctions with the Saline Waucoba road that winds its way along the crest and down into Saline Valley in Death Valley National Park. Beyond the summit the road drops down into Eureka Valley and the Eureka Dunes. Within the first few miles of this quiet mountain road buds are blossoming in the washes and ravines. Three miles south of Bishop is Warm Springs road. Turn east and head toward the base of the White Mountains. At the junction of Eastside road continue straight onto the graded dirt road that cuts across the alluvial fans that have spread from the canyons above. This five-mile section of gravelly dirt road cuts a swath through an abundance of exquisite flowers currently in bloom. This is Black Canyon road and is best done with 4-wheel drive. Stop and take a walk and examine the small petals and soft color. This is a riparian wetland and is one of the richest wetland floras in the Great Basin. With over 125 plant species, including eight rare species, Fish Slough will be an extravagant find for flower enthusiasts. The diversity of species will deliver a greater variety of color and size. Blossoms of cream, yellow and magenta will carpet the slopes bordering the slough. This is a protected area designated as an Area of Critical Environmental Concern (ACEC). 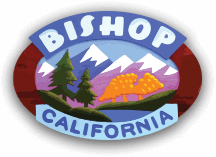 It can be accessed via Five Bridges road 2.5 miles north of Bishop on US Highway 6. More information about Fish Slough can be found here. The wildflower bloom will begin a little later in the season and continue well into summer here. The good rain and snowfall earlier in the season combined with recent warm temperatures indicates that the big bloom may continue to climb into the higher elevations. Rock Creek road, about 25 miles north of Bishop along US Highway 395, has been recently upgraded by the US Forest service. It runs for about 9 miles alongside the river in the narrow, steep sided Rock Creek canyon. Within this short distance a diverse array of plant communities can be seen. An orchid and tiger lily bloom alongside the road’s edge where water courses down the canyon in small streams. Once the snows have cleared and hiking season begins, a short walk from Mosquito Flat (where the road ends) will take you over streams and through meadows where subalpine wildflowers flourish. The road to the McGee Creek campground and trailhead is narrow and winding. Up here the color that is visible year round is in the layers of rock strata. In the flowering season though strokes and splashes of white, yellow, red and purple paint the landscape for only a brief period. The color revolution begins in early summer with a base of green that varies in hue and tint. Plant species range from the large cottonwood trees to groves of quaking aspen to the round sagebrush and elegant paintbrush down to a small white flower on a thin green stem commonly called “rays”. From the turn off at US Highway 395, just 32 miles north of Bishop, the road is but 2 miles to the campground and 1 mile more to the pack station. At an elevation 7,500 feet the short trip alongside this creek will deliver beautiful views of Crowley Lake to the east and impressive ridges and peaks to the west. Wildflower blooms are subject to many factors and blossoming occurs at different places and different times. 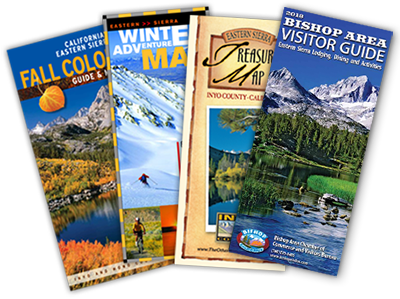 Come in to the Bishop Visitor Center at 690 N Main Street in the heart of beautiful Bishop. Speak with our friendly and knowledgeable visitor center staff to find what’s happening where. We have loads of maps and can probably answer just about any question you have about our ‘big backyard’.